Unlike hot cocoa and snowman, two words not associated with winter are “fresh produce”. It’s easy to be tempted to grab some unhealthy comfort food and leftover holiday treats instead of seeking out healthy foods this time of year. Holiday time and winter in general are notorious for some to put on some extra pounds. It’s important to be extra mindful this time of year when making food choices. The above statement is easier said than done as this time of year can be very challenging to keep up healthy habits. It’s cold, gets dark early and outdoor time becomes severely limited. As a Registered Dietitian Nutritionist, I feel a little extra responsibility to guide my clients on how to do this. I hope this blog inspires you to want to enjoy some produce and eat well through the winter. Challenging does not mean impossible. What can you do to keep your immune system strong? Buy fresh produce. 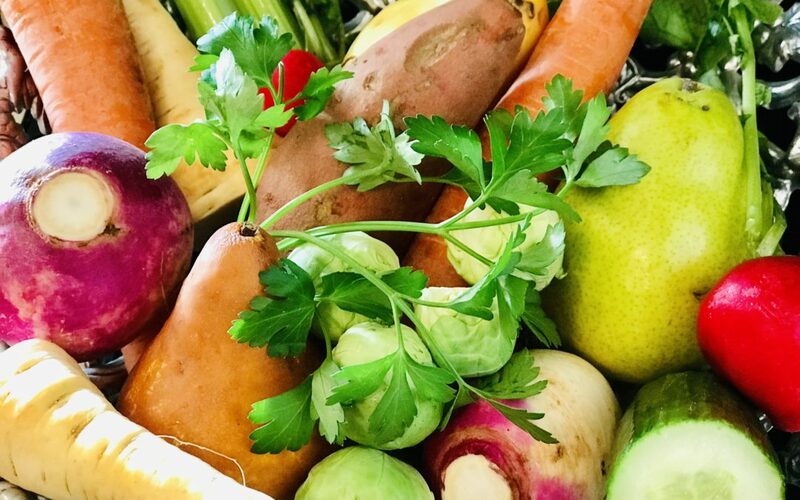 Supermarkets still have some of our summer and fall favorites (due to modern technology), but in-season foods are fresher, tastier and more nutritious, not to mention less expensive than out-of-season produce. *See below for my top picks. Stock up on frozen fruits and vegetables. Stating the obvious here, but fruits and vegetables are rich in nutrients, fiber and phytochemicals and the flash frozen process retains those nutrients. This is a great way to boost your immune system to help fight infection. Cook with some hearty winter herbs (like rosemary, thyme and parsley) to give foods an extra kick. Rosemary is loaded with flavor and is a good match for hearty dishes, like meats, stews and stews. Parsley, even though it looks delicate, can also hold its own and brightens most dishes. In addition to its status as the iconic garnish, parsley is great for fish, eggs, and vinaigrettes. Thyme will also brighten up many dishes due to the lemony and minty flavors and it does wonders for marinades, soups, meats and fish. Turnips are are a slightly bitter (but good) tasting cruciferous root vegetable in the mustard family. One cup cooked turnips is a good source of fiber and and excellent source of Vitamin C, a key nutrient in the winter. Some lab studies have even shown anticancer properties. You can eat them raw (dip in hummus or dressing) or cooked. They can be kept refrigerated (wrapped in plastic) for about two weeks. The greens are edible, so saute or use them to make pesto. Parsnips are part of the Apiaceae family (like carrots, celery, fennel and parsley) and are another sweet, starchy root vegetable to enjoy this time of year. One cup of cooked parsnips are an excellent source of fiber, vitamins C and folate and the mineral manganese. They are also a good source of magnesium, phosphorus, potassium and copper. Here’s a tip – prepare and enjoy parsnips like you would a carrot, both raw and cooked are delicious. Cauliflower peaks in the fall, but lasts well into winter. It’s a cruciferous vegetable (like arugula, broccoli, Brussels sprouts, cabbage and kale) that is part of the Brassica family. Cauliflower contains glcosinolates and sulforaphane, components that have anti-cancer effects such as anti-tumor and inhibition of cancer cell growth. These phytochemicals have also been shown to help cardiovascular health. It also contains other notable nutrients like fiber and vitamins C, K, B6 and folate. Broccoli, just like its family member cauliflower, is loaded with nutrients and cancer-fighting agents. 1 cup cooked is an excellent source of fiber, and vitamins A, C, K and folate. Tip – It’s best to steam or cook this versatile vegetable for short periods of time to maximize nutrient retention. Brussels sprouts (another member of the cruciferous family) is a winter standout! In addition to being linked to lower cancer risk in lab studies, did you know that 1 cup has more vitamin C than a medium orange? They also pack in vitamins K, A and folate, not to mention some protein too! Here’s my Brussels sprouts tip – Blanch for 2 minutes before roasting, this will lessen the roasting time and prevent them from being too hard. There’s so much you can do with cruciferous and root veggies! Eat raw or cooked (steam, roast, blanch, microwave) and experiment with herbs and spices to enhance flavors. A squirt of lemon or lime juice will always perk up the flavor too. You can also make your own quick marinade or a use salad dressing before roasting. Also, a tiny drop of olive oil, salt and pepper go a long way with flavor. The aforementioned vegetables are readily available in the winter, and, the other good news is that many supermarkets have already cut up versions of these winter treasures. I’m going to come clean here, I tend to buy a lot of precut veggies, it just makes things easier on busy days! Which winter produce do you like?